Dr. David Dalin's newest book is the first history of the eight Jewish men and women who have served or who currently serve as justices of the Supreme Court. In his presentation, Dalin will discuss the Jewish background, identities, and legacies of the Jewish Justices and the changing role of Jews within the American legal profession. He will also address the antisemitism some of the justices encountered in their ascent to America’s highest court. the United States and the Jews. 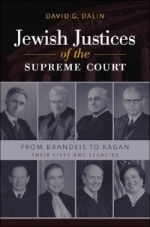 His book Jewish Justices of the Supreme Court: From Brandeis to Kagan, published by Brandeis University Press, was recently selected as a finalist for the 2017 National Jewish Book Award. Co-sponsored by the Jewish Bar Association of San Francisco. Program made possible, in part, by Marilyn Dobbs Higuera in memory of Stephen Dobbs.